Dave O’Neill feels he has a responsibility to pass on his passion for music to others, Chris Johnson writes. 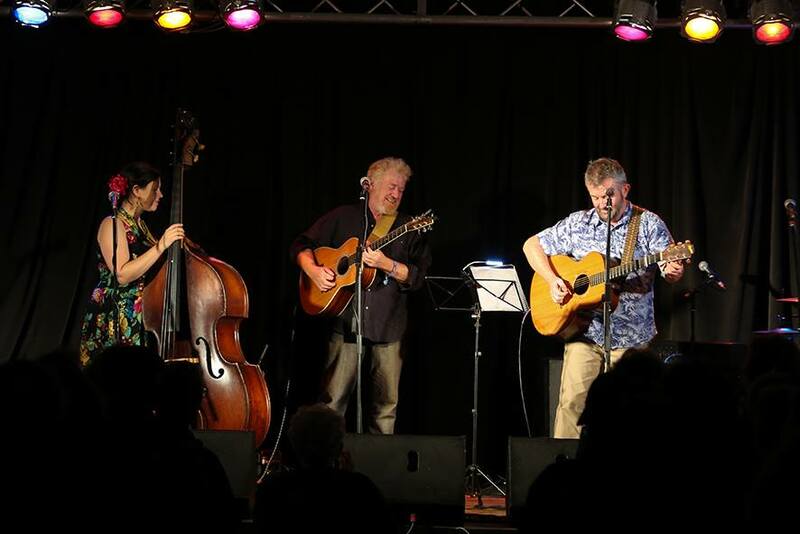 When Canberra music identity Dave O’Neill was a young fella he was smitten with the blues and soaked up records from as many of the old great delta bluesmen as he could find. B.B. King was one of his favourites and he spent many long months learning all the guitar licks just the way B.B. played them. “Then I finally got to see him live in concert and it was great, but you know what, he didn’t play those guitar licks at all,” O’Neill says. “His solos in the songs were completely different to how he had recorded them – at least the records of his I had heard. Improvisation has been at the centre of O’Neill’s musical career and is something he is passionate about sharing with others. Trained in jazz and folk music (and he includes the blues and country when he is talking about folk music), O’Neill lives, breathes and eats music. Career-wise, things have had a habit of lasting about seven years for him. For seven years up until a year ago, O’Neill was the artistic director of the National Folk Festival. A few years before he joined the festival, he had a taste of the job with a year-long stint at it in 2000. “But I was touring with Eric Bogle during that time and I couldn’t commit to the [festival] for more than that year,” he says. And how long was he touring with Bogle? Bogle, of course is that legendary Scottish-Australian folk singer who gave to the world such outstanding and heart-wrenching songs as And the Band Played Waltzing Matilda and No Man’s Land. O’Neill played a number of stringed instruments in the Bogle band as they toured extensively, not only across Australia but in America and Britain. “He’s fantastic, a really lovely bloke,” O’Neill says of his former band leader. “A lot of people think he’s grumpy but I think it’s a bit of self-protection. Because of the songs Eric writes everybody comes up to him to talk. “He likes that, but they are often telling him heart-breaking stories, so I think he puts on this slight protection kind of thing, but he’s actually one of the most generous men I’ve ever met. When O’Neill’s tours of duty with Bogle finally wound up, the National Folk Festival came knocking once more. He grasped the opportunity and became somewhat of an institution as the festival’s artistic director and as a performer of incredible talent and stage presence. The artistic director gig though, he confesses, was not an easy job. “It’s a massive challenge because you’ve got to cover so many genres and so many skill levels,” O’Neill says. “The [festival’s] strength has always been in its participation. That’s what it’s for. Unlike so many other music festivals where it’s all about what’s on stage, the National is about what’s on stage inspiring you to be able to play. “In an ideal world you should be able to go and see the people on stage and they should be the best you can ever get in whatever genre; there should be several workshops in the style and there should be chances to jam with them. “And you’ve also got to book people who are absolutely inspirational, book people who will soon be inspirational and also people who are one day into the future hopefully going to be inspirational. With this year’s National Folk Festival upon us, O’Neill will be returning as a featured artist with his musical partner Bob Rodgers. Rodgers & O’Neill is a highly successful folk music duo and will be playing three shows at the National over Easter. “We’re known as the Odd Couple, but we really make it work well together,” O’Neill says. “Bob is amazing. He’s one of the most natural musicians I’ve ever played with. He can just hit all the right notes without having any idea of what the notes are. O’Neill is about to embark on his next career venture and will soon launch his own teaching project. And he has a particular clientele in mind. “I specialise in teaching adults,” he says. “I love teaching kids too. I do a couple of days teaching kids at Turner Primary School and that’s great. I’ve got tiny little kids screeching on the violin and it’s just fabulous there. “But really I want to teach adults how to play music. I particularly want to teach people who have never played before but have always wanted to. “It will be mostly one-on-one tuition, but I might do a bit of group tuition as well. “And I will also be offering 10-week courses like basic improvisation for folkies, or basic harmonies, or basic blues, or whatever and run those as night courses. O’Neill plays and teaches guitar, fiddle, mandolin, ukulele and voice and in a variety of styles. He also plays bouzouki and banjo and could be persuaded to give a few lessons in those instruments. “Guitar and fiddle were my main instruments for years and mandolin came later,” he says. O’Neill believes that one thing lacking in many Australian musicians is their confidence and presence on stage. “We’ve got some fantastic musicians here but often what they lack is gigging experience,” he says. “What I noticed touring a lot is that overseas there are so many opportunities to play, whereas in Australia there’s just not. It’s a hard place to make a living as a musician. As the folk festival’s artistic director he was always keen to book artists who were willing to share lessons in stagecraft. But after seven years organising the program for the National, it was time to move on. “I think seven years in a creative artistic job is long enough. I think you run you out of steam,” O’Neill says. O’Neill left the National to go straight into a new role as the chief executive officer at Music For Everyone, a community-based organisation that specialises in group tuition and does a lot with music for people with disabilities. But the job was largely administrative, and O’Neill felt the itch to personally teach too overwhelming. So after eight months as the CEO, he moved on. “Music For Everyone is a fantastic story, it really is. They have fantastic teachers there,” he says. “They make music really accessible and because they do group tuition, it brings the costs down. It’s a really fantastic organisation. “But I realised that it wasn’t the right fit for me and I really needed to get on to actually teaching. “Once you get to a certain age and certain ability with something you actually have responsibility to pass it on. “I want to get across to people that music is a great social activity and it doesn’t have to be complex.